I wanted to thank you for the wonderful trip you put together. You took our ideas and helped me make my husbands 40th birthday golf trip one we’ll never forget. Your quick response to all my questions (I know I had many) and your wonderful suggestions truly helped to put my mind at ease and made me confident that I chose the right company. From the moment you put us in the capable hands of our driver Roy, it allowed us all to sit back, relax and enjoy the ride! All 4 men, Doug, Terry, Chuck & Kevin enjoyed the golf immensely. The Old Course was amazing and the history that comes with it is extraordinary. My husband had butterflies as he teed off for the 1st time. The men were so happy to have had the guaranteed tee time you provided. We saw so many that waited days unable to play the course. 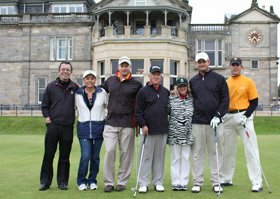 They also enjoyed Carnoustie. It was the most challenging to them and Scotland did not disappoint that day with the infamous “Scotland weather”. We will definitely be back to visit your beautiful country and we will certainly recommend Golf Vacations UK to all our friends who can’t wait to make the trip we just made! Kudos to you and your staff for a job well done!